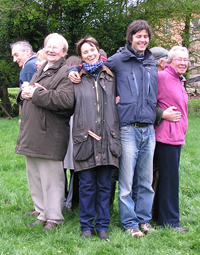 Slimbridge Dowsing Group members dowse for energy spirals in the meadow behind Slimbridge Church. There are spirals everywhere. It’s one of nature’s most repeated and strongest patterns. You can see spirals in sea shells, on a snail’s back, in plants and their seeds, notably the pine cone, as well as in cacti, corals and even the solar system. Man copied the idea - notice the strength of a spiral staircase. Why is it so surprising then, that spirals also emanate from the ground as an earth energy? They spiral upwards as positive energy, tower above us, then topple over and spiral downwards in the opposite direction as negative energy. Although they aren’t visible to the naked eye, we dowsers find them all over the place with our dowsing rods, and happily watch our rods turning full circle, rapidly in a strong spiral, more slowly in a weaker one. Glebe field with a group hug. We stand in the uplifting part, avoid the down draft, and notice with wonder how the positive spiral usually comes from a patch of longer grass while the negative downward part returns to a patch marked at this time of year by daisies. In his talk on Thursday 9 March, Peter Gibson talked about Earth Energies in general, but spirals were the star of the show. Dowsing rods are one of the few methods able to detect such phenomena, which has been known and recognised since Nostradamus was a boy (1503–1566). Other earth energies include energy lines, which emanate from standing stones such as Stonehenge and Avebury Ring; a vortex (plural: vortices), ascending and descending, usually vertically; earth grids which form a regular pattern of crossing lines and, the best known, Ley lines, which link sacred sites such as the parish church in Wotton-under-Edge with Gloucester Cathedral. The highlight of Peter’s talk was when we went across the road to the meadow behind Slimbridge church and dowsed for spirals ourselves. There are several to be found, the strongest in the far corner, to which we were all drawn for an uplifting group hug.